It’s time for another bloomin’ recipe! 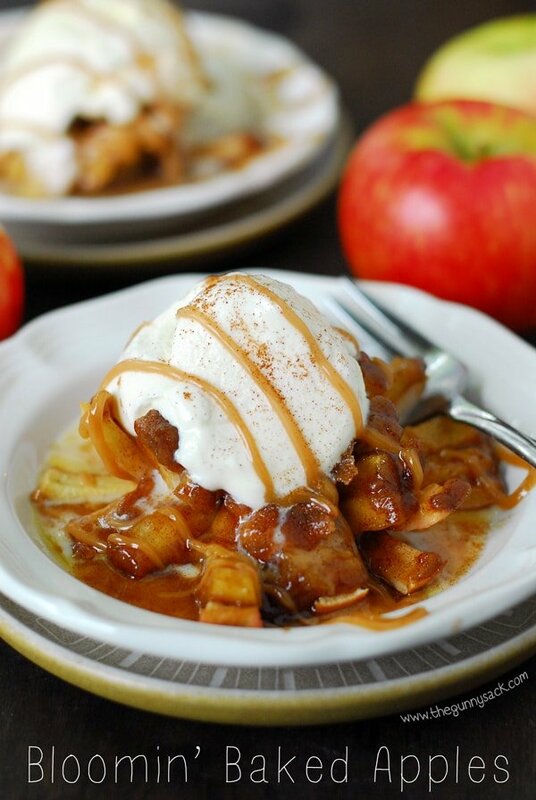 It all started with the bloomin’ baked apples which are popular with my family and with all of you. 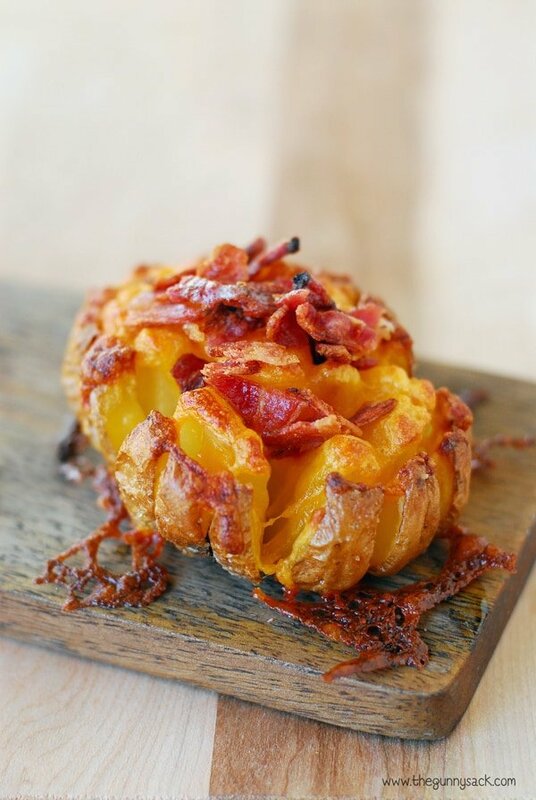 Next, I made the bloomin’ baked potatoes and they are my son’s favorite. 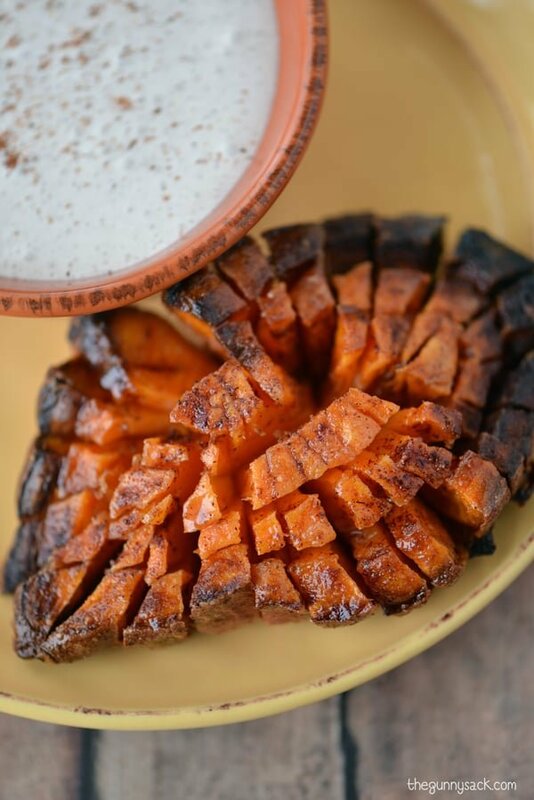 Then, I made bloomin’ sweet potatoes, which I love! So, I wanted to make another bloomin’ recipe and once again turned to two of my family’s favorite things: cheese and garlic! 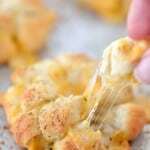 This Bloomin’ Garlic Cheese Biscuits recipe reminds me of cheesy pull-apart bread or monkey bread. Everyone loved them and were disappointed that the recipe only made ten blooming cheese biscuits! Make 4 slits in the biscuit one at the top, one at the bottom and one on each side. Then, cut two slits in each segment, so you end up with 12 segments of dough. Cut the block of cheese into cubes and rectangles. You need 10 cubes of cheese that measure about 1/2 inch. You need about 120 small rectangles of cheese that measure about 1/2 inch by 1/4 inch. 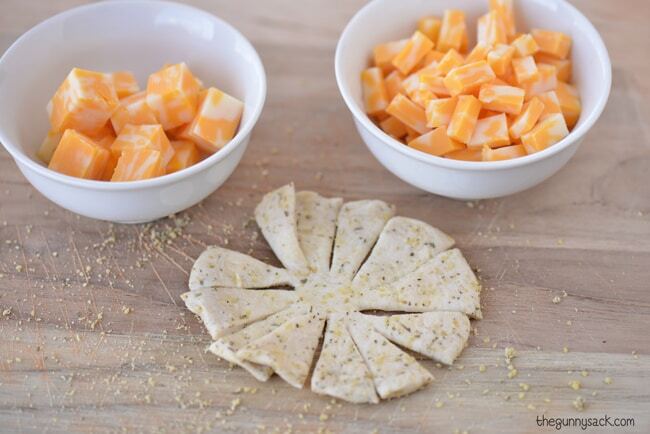 To make this step easier, cut ½ inch strips of cheese from the block, stack them up and cut them into smaller pieces. Roll a small rectangle of cheese up in every other segment of dough. Then, roll a rectangle of cheese under the remaining segments of dough. Put a cube of cheese in the center. Brush the biscuits with melted garlic butter and sprinkle with more parmesan. Bake at 400 degrees for 8-10 minutes or until golden brown. 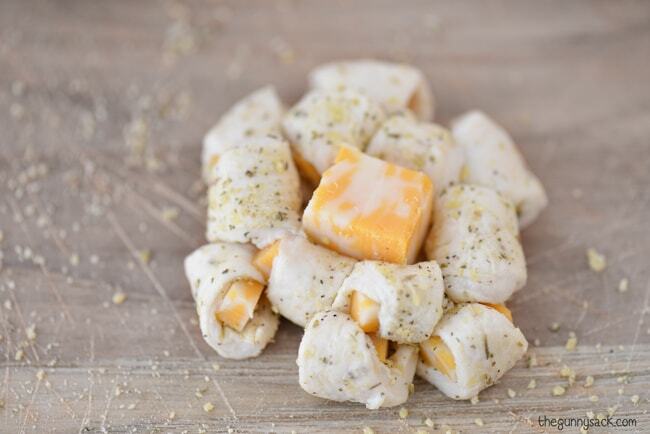 Allow them to cool slightly and then enjoy the warm, cheesy goodness! 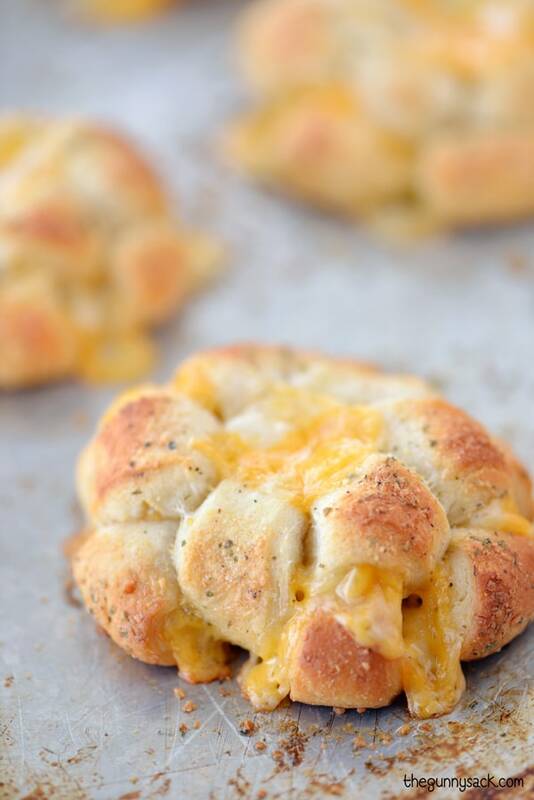 These Bloomin’ Garlic Cheese Biscuits work great as an appetizer, a snack or as a side for a meal. 10 count refrigerator biscuits I used Pillsbury Grands Jr. Buttermilk Flaky Layers Biscuits. Block of cheese I used marble jack. Flatten the biscuits and sprinkle them with parmesan cheese, garlic, parsley and oregano. Cut the block of cheese into cubes and rectangles. You need 10 cubes of cheese that measure about 1/2 inch. You need about 120 small rectangles of cheese that measure about 1/2 inch by 1/4 inch. To make this step easier, cut 1/2 inch strips of cheese from the block, stack them up and cut them into smaller pieces. Roll a small rectangle of cheese up in every other segment of dough leaving the center empty. Bake at 400 degrees for 8-10 minutes or until golden brown. 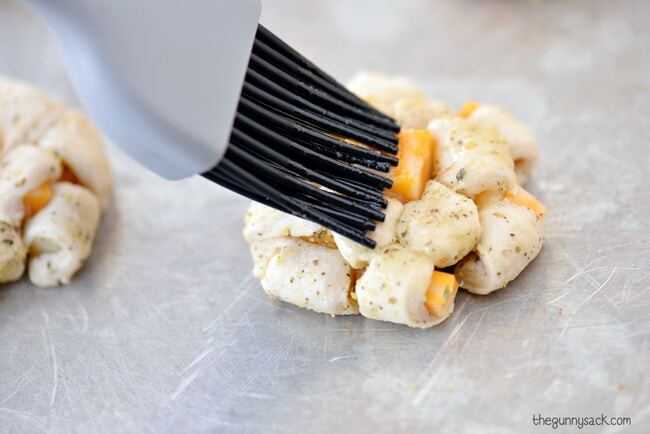 Definitely your garlic cheese biscuits are awesomeness! This is a great recipe, as you know I made it a short while ago and it was lovely, in fact have made it again since. Thanks for sharing! The colors are so vibrant- your photography is fantastic! 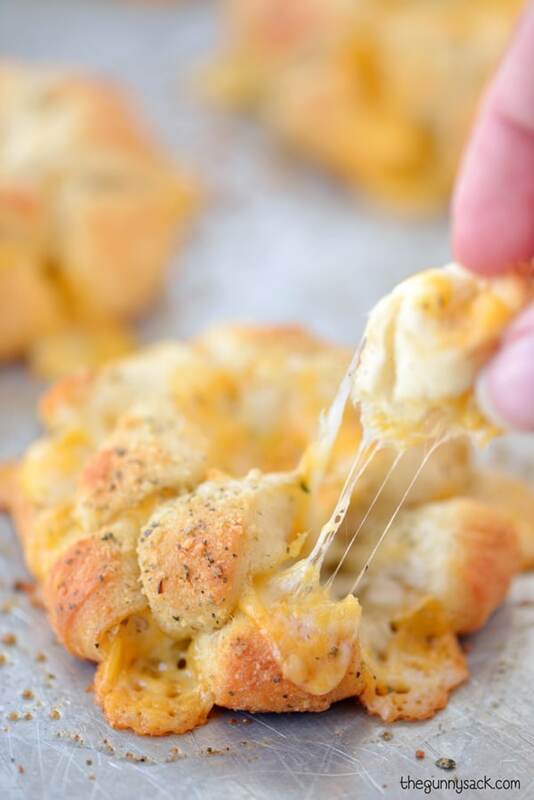 This Bloomin’ Garlic Cheese Biscuits looks absolutely fantastic. Beautiful photos, too. I look forward to trying this. Oh my goodness – just tried these and they are delicious! New family favorite on spaghetti night! Thank you so much!! Woohoo! That is fantastic! Thanks for letting me know! I cannot wait to try these! I know I’ll sound un-American, but I do not like most cheese. I do like a little mozzarella though – so I’m going to alter your recipe with little tiny pieces of mozzarella cheese and then dip them in spaghetti sauce! YUM!! Thanks for these recipes! I’m definitely trying the bloomin’ apples too!!! Thanks! How about serving with a little marinara sauce on the side ? Stumbled across this using StumbleUpon (okay, bad pun), and pinned it right away. 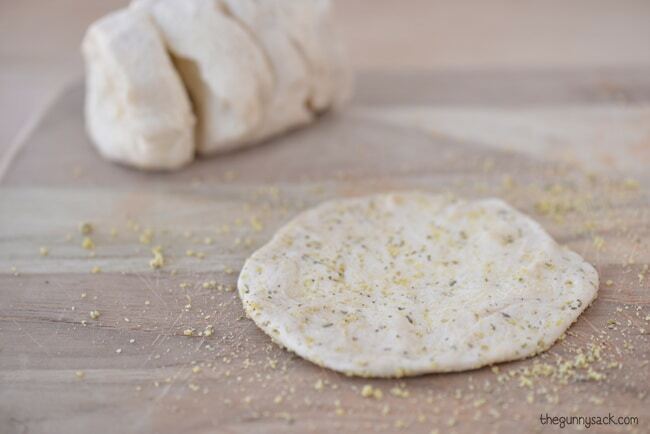 I think I might use my recipe for homemade dough (or maybe not…sometimes fast is good! ), but these look amazing! Wow! You’re a freaking genius! These are going to the top of my “to make” list. Thanks! Great idea and I can’t wait to try it, but Grands Biscuits come in packages of eight, not ten. I used Grands Jr. Biscuits, the smaller version, and they come in a pack of 10. Enjoy! Love cheesy biscuits! These look incredible! LOVE the creativity! These are super cute, and hey — they’re full of cheese! Cheese is the best! Thanks Ashley! Yum yum yum! Layers of cheesy, garlicky goodness 🙂 These look so good and they’re so creative! Yes!! 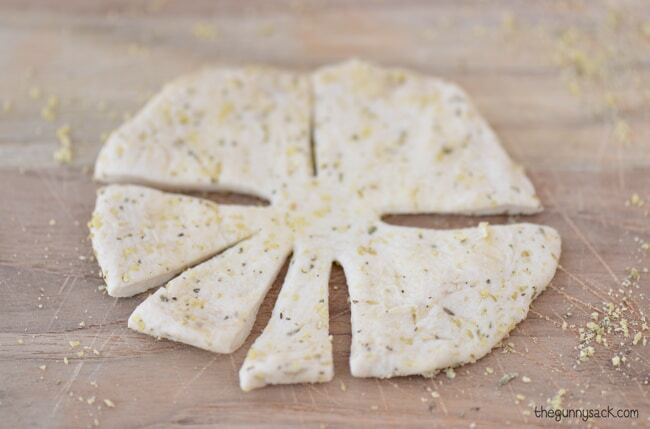 Cheese + Garlic is the best! Thanks Medha! 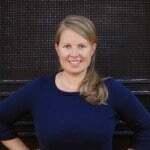 You are definitely the queen of blooming recipes!! I love this idea! Such a fun way to do a cheesy biscuit!! What a great shaping technique. These look utterly delicious. omg … these are so ridiculously adorable … and they look pretty easy too! I bloomin’ love all of your bloomin’ creations! Thanks Kimberly! They are so much fun! Thanks Martha! When I posted this recipe, I thought the same thing! Girl, you got on the bloomin’ train and never got off! Which is good for all of us because this recipe is pure delicious brilliance. You knocked this one out of the park! Haha! So true! Thanks Kristy! Oh my gosh, this is such a great idea! I love all the cheesy goodness! Thanks Joanie! 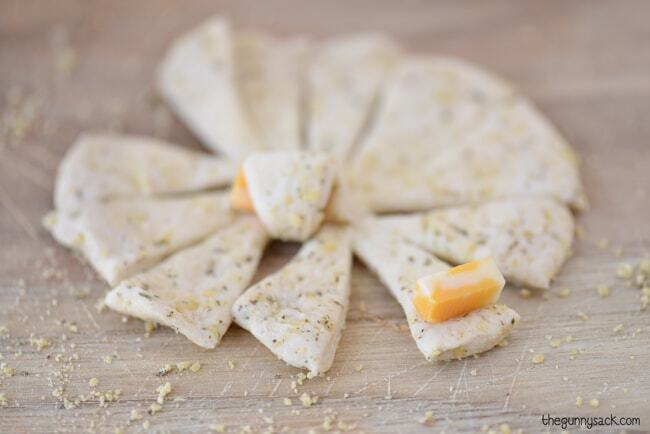 We love all things cheesy too! OMG this is genius!!! The way you roll the cheese inside? Genius! Thanks Jocelyn! The cheesier the better! WOW – this looks amazing, sounds amazing, and I bet it tastes amazing! Thanks Kate! They turned out so cute! 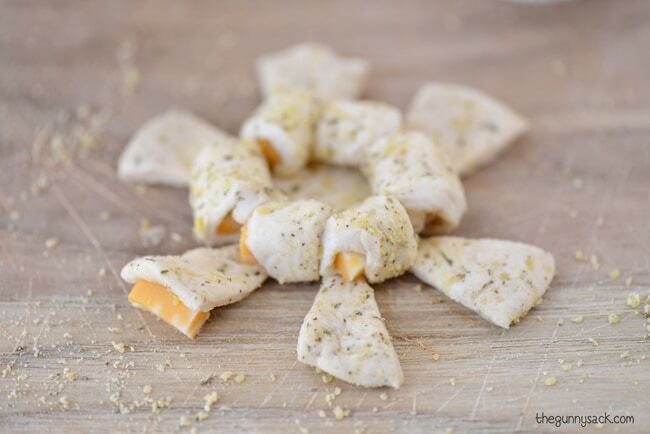 These look so cheesy and yummy! And super easy! All three of my favorite things! Thanks Mischa! Thanks Amy! My kids were certainly wishing for more! These are gorgeous! Love the layers of cheesy goodness! Thanks Lisa! We love that too!